Karoo Adventures had an open day on Saturday 9th July when they introduced invited guests - mostly the owners of accommodation establishments in town - to another exciting addition to our outdoor adventure activities, a 'Zip Slide' in the Koo! 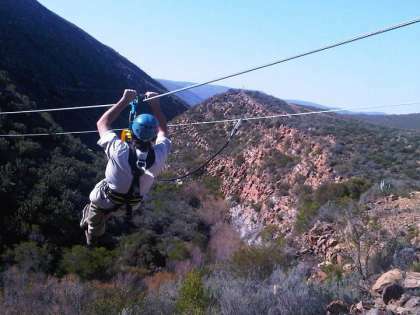 Situated roughly 50 km outside Montagu in one of the best preserved canyons in the Koo Valley, it is a perfect outing not only for the adrenaline junkies, but for all nature lovers. The setting really is quite beautiful, as are so many parts of the Koo and Keisie. Throughout the day squeals of delight could be heard (the ladies of course!) as the braver of the guests zipped through the canyon, traversing from side to side. There are six platforms & slides that vary in speed and height. It is good to be able to report that the launching /landing platforms and network of cables spanning the canyon does not impact adversely on the landscape at all, it is hardly visible to the eye. Even though it is considered to be an outdoor adventure activity, it is suitable and great fun for young and old. More than one of the '50-plussers' volunteered to give it a go and emerged with big ready-to-go-again smiles as they landed back on the last platform at the end of their run. The Karoo Adventures Zip Slide will be officially open to the public at the end of July, and will definitely be ready when the JUNIOR OFF ROAD NATIONAL takes place on the 6th August, also in the Koo, .